Are Delivery Drones Actually Better for the Environment? Maybe — but size matters. The idea of using drones to carry out deliveries is quickly coming to fruition around the world. The French postal service began a trial in 2016 and Amazon has made no secret of its plans for the technology. Now, a new study has shown that drone delivery might be more than just cool and convenient: it could also be good for the environment. Research published in Nature Communications compared the impact of multi-copter drones (which are, for the time being anyway, the design most well-suited for deliveries) with traditional, diesel-powered delivery trucks. Drones yielded lower energy use and greenhouse gas emissions for small packages of around 0.5 kilograms. However, the results were mixed when it came to packages weighing 8 kilograms: greenhouse gases were 9 percent lower in California, but 50 percent higher in Missouri. That figure comes as a result of the state’s carbon-intensive electricity grid. There are other caveats to the benefits of drone delivery services. Crucially, while there’s an obvious benefit to shifting away from delivery trucks that rely on fossil fuels toward the use of battery-operated drones, the logistics of using drones presents a greater need for warehousing. Implementing any drone delivery service would require warehouse facilities to be spread across a wider area, which would allow for trips between the warehouses and the recipient’s address to be as short as possible. We can’t ignore the impact that this additional infrastructure will have on the environment. 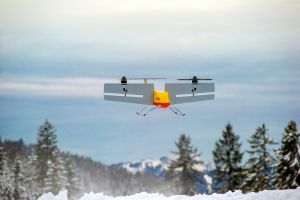 That’s not to say that making deliveries via drone won’t have some positive effect on the environment, but it does highlight the need to pay attention to all the contributing factors. In order for us to really improve upon current freight techniques, the advantages of drones, the drawbacks of expanded warehousing, and the potential of trucks that don’t rely on fossil fuels must all be considered.